This recipe makes 16 lovely gooey brownies with luscious raspberries embedded in the middle, but can be halved to produce a more waistline-conscious 9. 1. Preheat oven to 170C / gas 3. Butter or line with baking parchment a 23cm square cake tin (or 18cm if using half quantity). 2. Melt the chocolate and butter together, then cool slightly. 3. Whisk the eggs until thick, then gradually add the sugar and beat until glossy. Beat in the melted chocolate mixture, then gently fold in the flour, baking powder and salt. 4. Pour just over half the mixture into the prepared cake tin. Scatter over the raspberries, then cover with the remaining mixture. 5. Bake in the preheated oven for about 35-40 minutes or until the surface is set. it will be cooked when a skewer into the middle comes out with just a little mixture adhering. 6. Remove the cake to a wire rack and allow it to rest for about 20 minutes. Cut the cake into squares and remove them from the tin when they are completely cold. 7. 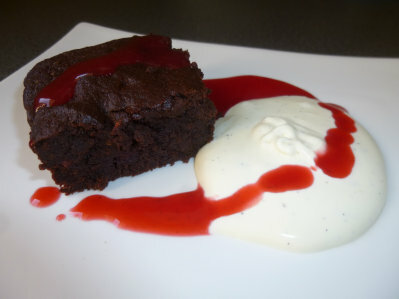 Serve with crème fraiche or cream or ice-cream, with a little raspberry coulis and a few fresh raspberries, if you like.